I regularly Segway north on Noe Street and turn right onto Market when i’m headed downtown or to the gym, and perhaps as long as ten years ago i noticed that every time i crossed 17th Street, a homeless man with brooms sticking out of his shopping cart would be standing at the northeast corner. He was always there. A fixture. Well, during the day. They disappear somewhere at night. At some point i waved at him as i went past, and he waved back. I started paying a little more attention and noticed that frequently someone was talking with him. No, not brushing rapidly past him to avoid being panhandled, but standing there talking. Hmmmm. Look, i’m not one of these comfortably housed people who bristle with hatred at the very sight of a homeless person, but i admit that i’d never actually sought one’s company, preferring to donate to organizations that help them rather than getting all that close myself. Still, for whatever reason, just a few years ago one winter day i stopped and spoke to him. Asked him how he was doing. He was not drunk, and i’ll jump ahead in the narrative here and mention that on none of our subsequent hundreds of encounters did he give the slightest impression that he was under the influence of anything stronger than coffee. And he was articulate, and a keen observer, and had read extensively. So i became one of the people who talked with him, and managed to extract from him that his name was Barry LeBlanc although he was not at all generous with biographical details and came back with a strong negative when i asked if i might write about him or take a picture. I should also mention that he never panhandled me, nor did i ever see him panhandle anyone else. How the hell did he survive? i wondered. So i started slipping him a buck sometimes, at first when it had rained the night before while i was snug and warm and dry at home in my soft bed, and then later even on nice days. 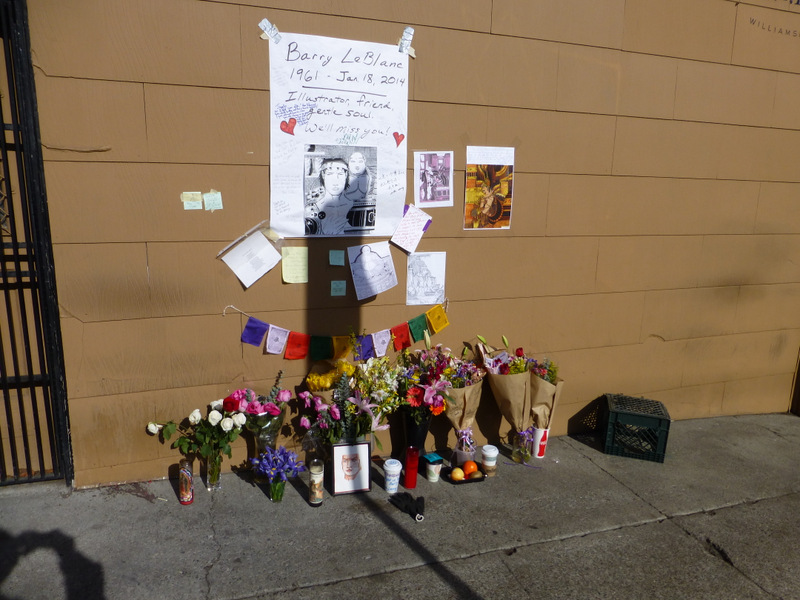 And then a couple of years ago the police started hassling him and made him move away from “his” corner at 17th and Noe. Someone had complained. And yes, one of our rights as Americans is to know our accuser, but this requirement is waived for the homeless. Still, since it was clear he wasn’t panhandling and was even sweeping a section of the sidewalk, the cops let him stay at the corner of 15th and Market during the mornings and across from the library on 16th Street in the afternoons. And somewhere along in there i started trying to do a little delicate outreach, hoping to get him to apply for one of the city’s homeless assistance programs for some housing or shelter or at least a goddam bath, since he was absolutely filthy even though he kept his beard and mustache neatly trimmed. But no, he liked his independence. And people regularly spoke to him and slipped him money, so he had enough money for food, coffee, and cigarettes. BTW, nobody was ever able to talk him into applying for any kind of public assistance. As the years went by, I kept slipping him dollars and trying to help him some way, but even just feeding him was an issue since his teeth were all ragged stumps, so he couldn’t chew anything. I could barely even get him to take any of my jams and jellies except the raspberry, which had been a childhood favorite. I joked with him about how i’d never met anyone else as stubborn as myself, and that i could see some irony in my advising him to get help while i very much cherished my own freedom to ignore the advice of others. When Rina was here last November, i introduced her and he managed a greeting in Dutch that he’d remembered from a stay in Amsterdam in his youth. Afterwards, she observed that he was handsome. What! i wondered. And then the next time i saw him i looked at him objectively and realized that she’d been able to see through the dirt and was right. He was not displeased when i told him Rina had found him handsome. But then last week we both came down with colds or something. On Wednesday the 15th, we were both dragging, but he looked worse, and i brought him some coffee. On Thursday he hadn’t moved from the spot on 16th Street across from the library, and he seemed sicker. I suggested it was time to go to the hospital and he said no, but he did let me bring him a turnover from Rosenberg’s. On Friday i felt so bad that i wouldn’t have gone out if i hadn’t been concerned about him. Got there in mid-afternoon to find a homeless man named Jimmy fruitlessly hectoring him to go to the hospital. I seconded the motion, but he was adamant. He let me bring him a pack of cigarettes, and i stood there looking at him and saw that i was facing an ethics problem, that if one of us who knew and liked him didn’t call an ambulance and have him hauled off to the hospital against his will, he could very well die on the street that night. And as i stood there in front of him, the realization swept over me that i was not going to be the one to deny him the freedom to die on his own terms. So i laid my hand on his shoulder and said goodbye and rode back home to bed. I felt too sick to leave the house on Saturday, and maybe i just didn’t want to know, but on Sunday i got dressed and rode down there to discover that everybody who knew him had made the same decision i had and that he’d been found dead about 3:00 Saturday morning. Were we right? The Church would disagree because the Church will force its rules on you whenever it can. But i know what Barry wanted and that’s good enough for me. An uplifting and sad urban tale. There’s a homeless guy named Jimmy (the one who was hectoring Barry when i was there the afternoon before his death) who’s guarding the shrine and is involved in organizing the wake. I’ll do another post on this as i get more information.